Run introduced Jay's sons T.J. and Jam Master J'Son, who performed "some beats." The 40-minute set included "It's Tricky" to a sea of flailing arms, Run putting on Adidas for "My Adidas," and a rocking version of "Walk This Way." 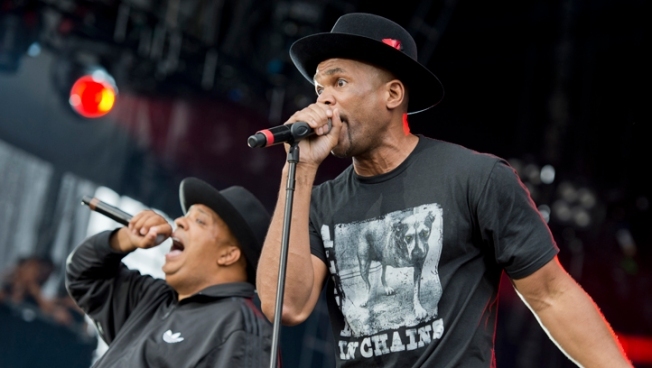 Run DMC performed for the first time in over a decade Sunday at the Made In America festival. Under a video banner that read "Jam Master Jay Forever," the Queens, N.Y., natives rocked tens of thousands of fans at the festival in Philadelphia. The 40-minute set included "It's Tricky" to a sea of flailing arms, Run putting on Adidas for "My Adidas," and a rocking version of "Walk This Way." Perhaps the most poignant moment came when Run talked about the group's breakup following the death of Jam Master Jay. Jam Master Jay, Run DMC's longtime DJ, was fatally shot in 2002.